Harry Kane joined the Premier League’s 100 Club on Sunday with a last-gasp equaliser in Tottenham‘s 2-2 draw at Liverpool. In a pulsating encounter at Anfield, Kane appeared to have fluffed his chance to bring up a century of goals in the competition when his late penalty was saved by Loris Karius. But the England international atoned for his miss in the 95th minute when Spurs were awarded a second penalty, and their star man made no mistake in converting. We’ve taken a closer look at his 100 Premier League goals for the north Londoners, including how he has scored them, his favourite opponents and when he is at his most lethal. Unsurprisingly, the majority of Kane’s goals – 60 out of the 100 – have come via his right boot. Out of the remaining 40, 26 were scored off his left foot and 14 were from headers. Twelve of the 100 were also scored from outside of the box. Despite scoring eight hat-tricks, three short of Alan Shearer’s Premier League record, Kane is yet to score a ‘perfect’ hat-trick. With a shot conversion rate of 17.9%, Kane has scored at an average of a goal every 113 minutes. Kane’s penalty against Liverpool was his fifth goal in seven matches against the Reds, but they’re still far from his favourite opponents. 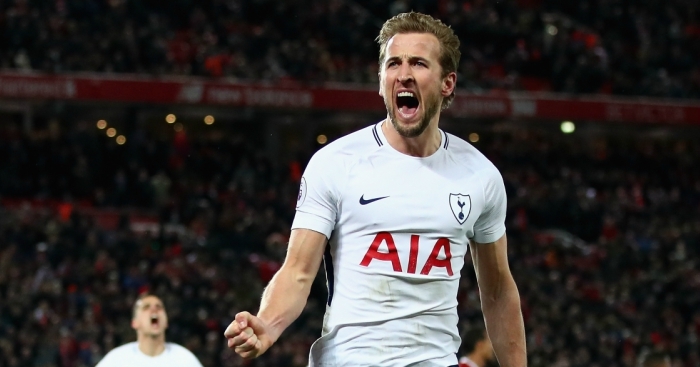 In six Premier League fixtures against Leicester City, Kane has scored nine goals against the Foxes, while he has scored eight in eight against Stoke City. One feat which has endeared him even more to the Spurs faithful is his record of six goals in six matches against north London rivals Arsenal. The forward has only failed to score against two opponents in the Premier League to date. He drew a blank in two 10 minute cameos against Cardiff City in 2013-14, while he didn’t trouble the scoresheet against Brighton in December. Kane’s stoppage-time penalty at Anfield was his fifth Premier League goal scored after 90 minutes, but he has been most prolific in the 15 minutes just after half-time, scoring 23 of his goals during that time. The 24-year-old’s second favourite period is between the 61st and 75th minute, when he has scored 18 goals. In total, Kane has scored 43 first-half goals, with 57 coming after the break. Can you name every player to score a Premier League hat-trick for Spurs?